Gardens can do great things for your outdoor decor, but the general upkeep can be tedious. Try these tricks to make time spent tending your favorite florals easier and more efficient. Whether it’s the colorful buds that line your front walkway or the blooming beds out back, incorporating a lush garden into your landscape can pay off in spades. While time spent sowing seeds is well worth the effort, it tends to be more enjoyable when you can minimize the hours stuck toiling in the hot sun. Try these four strategies to help eliminate gardening growing pains and make your outdoor experiences that much more rewarding. You’ll want to start by researching plant varieties that are in line with your USDA hardiness zone, as well as species that are disease-resistant. 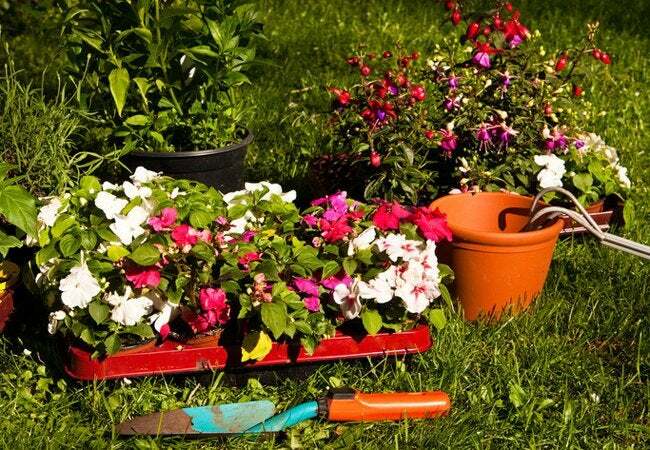 If flowers that require little upkeep are more your speed, consider annuals like lobelia, impatiens, or fibrous begonias, that continue to bloom without requiring constant deadheading. Also, beware of “fertile myrtles,” annuals like calendulas or cleome that reseed if you don’t get rid of the spent blooms come fall. If you’re interested in keeping them in your garden design, let them self-sow; but if not, deadhead to stop them from taking over. Group the thirstiest plants in one spot. This will improve watering efficiency, as you can tend to these high-maintenance varieties all at once, rather than making multiple trips around the garden. Next, save yourself hours you would have spent staking and prop up floppy, more delicate plants simply by placing stiff, bulky varieties in front of them. Lawn work is easily one of the most tedious yard tasks. Make things easier on yourself by eschewing grass on sloped areas and swapping in ground covers instead so that you don’t find yourself pushing a mower uphill. It’s also wise to pass on turf grass in areas that don’t have strong drainage solutions. And don’t overlook the importance of convenient tool storage: Consider purchasing a decorative container that you can tote along with you while tending the garden, so that you don’t have to trek to the shed or garage every time you need something. Buy tools with brightly colored handles, as these will easily catch your eye if left behind. Investing in a timed system is well worth the cost. 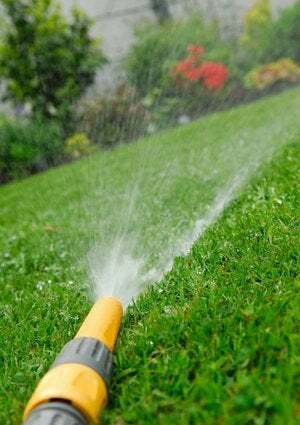 Soaker hoses with tiny pores that run the length of the tube are smarter than your standard hose or sprinkler, resulting in no run-off, less evaporation, and the luxury of being able to relax or complete other tasks while they go to work. Schedule the system to start in the early morning for best results. On days you mow the lawn, leave the clippings out instead of cleaning them up. This trick doesn’t make you lazy! More than saving you extra effort, it also helps shade the grass and conserve water. To start, plant densely and mulch freely around your flowerbeds to discourage uninvited weeds, but wage war on existing species when the soil is moist. While you can try to pull the weeds out by the roots, another simple solution is to cut them and let them wither. If they’re joining forces to form a thick mat, use a sharp shovel to slice the ground beneath them, then flip the weeds over to bury them. This will ensure your flowers’ safety and also nourish the soil when the weeds decompose.